There’s always been a sort of distinction between gaming laptops and desktop replacement laptops. While they can both offer a compelling PC gaming experience, the latter are usually too bulky and heavy to travel with you. However, the Razer Blade Pro is out to prove that desktop-like power in a thin and light package is possible. Blade Pro comes strapped with a quad-core Intel Core i7 processor and Nvidia GTX 1080 graphics, a 17-inch 4K display and 32GB of RAM standard – all nestled away in a 0.88-inch thick frame. If the all-black, unibody CNC chassis looks familiar, you’re not going crazy. It has an anodized finish fused to an aluminum chassis that should feel familiar to anyone who has handled an Apple product before. 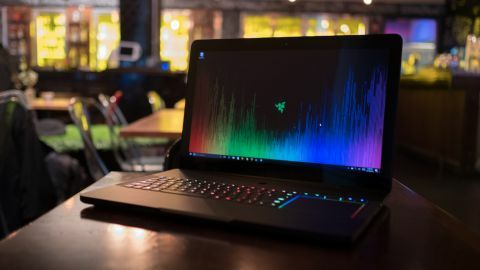 That said, unlike Apple, this hardware maker has stuck to its guns by still including a stylish, light-up logo on the laptop lid, which can be customized or turned off completely via Razer's Synapse software. All-in-all, it’s visually identical to the design you’ve seen on the Razer Blade, Razer Blade Stealth and even the 2015 Razer Blade Pro. It’s so similar to the latter, in fact, that it shares almost the same exact dimensions – 16.8 x 10.9 x 0.88 inches (42.7 x 27.7 x 2.24cm; W x D x H). Not that it’s a bad thing. The Razer Blade Pro is a startlingly portable 17-inch gaming laptop – weighing just 6.76 pounds (3.07kg) considering it size and density. Comparatively, even the recently slimmed down Alienware 17 weighs in at 9.74 pounds (4.42kg), being nearly half an inch thicker. For the last few weeks, we’ve been toting around a back-aching, 8.6-pound (3.9kg) Origin EON17-X as our desktop replacement. After exchanging it for the Blade Pro, a veritable weight had been lifted from our shoulders. Crack the laptop open, and you’ll find keyboard deck layout unlike most laptops you’ve seen before. Rather than positioning the trackpad beneath the keyboard, the Blade Pro’s pointing device is beside it on the right-hand side. More than once, we found ourselves tickling the surface below the keyboard, but it doesn’t take too long to get over this phantom pain. In fact, within an hour of playing with the Blade Pro, we were accustomed to the trackpad’s new placement, and can say it is the best one we’ve used on a laptop this year. Those that remember the first iteration of the Blade Pro might recall that this same space was once occupied with a digital touchpad and an optimistic, but ultimately flawed, Switchblade UI. However, this time around Razer has kicked the troublesome interface for an oversized glass-lined surface for slicker cursor movements and more space to move around. The taller, squarer shape makes scrolling a breeze. It’s an arrangement that feels familiar if you’re used to having your mouse next to a keyboard and it’s also far more convenient to use than a trackpad positioned between the wrist rests. As cool as the Blade Pro’s trackpad is, let’s not overlook the keyboard. It may look like the standard chicklet layout we’ve seen on past Razer devices. But, tap on any of the keys, and you’ll feel and hear the sweet sound of a mechanical switch. For the first time, Razer has implemented its Ultra-Low-Profile Mechanical switches on a notebook – after their debut on an iPad Pro keyboard, of all places – and they feel spectacular. Keys sink in with a tactile and satisfyingly audible click. In addition to having a true actuation and reset point, the switches help the keyboard feel more like the one you’d find attached to your gaming rig at home. MSI may have been the first to ramshackle a mechanical keyboard onto the MSI GT80 Titan, but Razer solution is more elegant, takes less space and is actually designed for a notebook. The only thing we wished Razer would include with these key switches is a tiny bit more travel for a crisper typing experience. As ever, Razer’s completely customizable Chroma lighting scheme makes its return with 16.8-million colors, and this time, it’s been expanded to the track lighting around the touchpad. On top of individually tweaking the colors on each key, you can now set up a rainbow to run a ring around the pointing device. The colorful customization is a welcome addition, otherwise the Blade Pro’s interior most notable feature would have been the two fat, featureless slabs of aluminum above and below the inputs. The Razer Blade Pro’s most alluring feature is its 17.3-inch IGZO display which, beside the 4K resolution, also supports 100% of the Adobe RGB spectrum, multi-touch control and Nvidia’s frame rate-smoothing G-Sync tech. Few other gaming laptops come with a screen that’s as full featured – the only glaring omission being a 120hz refresh rate seen on some other Pascal-powered rigs. More importantly, nothing short of an OLED panel on the Alienware 13 can match an IGZO monitor’s ability to produce vibrant colors and pitch black levels of contrast. Thanks to these features, the Razer Blade Pro lends itself to be just as good at rendering beautiful game worlds as it is for accurately color correcting videos. The Blade Pro also happens to be equipped with Razer’s brightest display yet. While indoors, we hardly had to bump up the backlight past 30%. Even at 50% screen brightness, this 17-inch screen easily overpowered any bright winter sunlight coming through our office windows. For a laptop, the Razer Blade Pro sounds surprisingly good, too. The 17-inch gaming laptop comes with dual-firing, 2-watt speakers enhanced with a larger speaker box and added pre-amp. Additionally, on both sides of the notebook, you’ll also find a pair of smaller side speakers to help add an extra layer of surround sound.